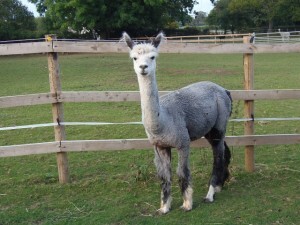 New Addition to my small herd – a lovely grey female called Kiera. 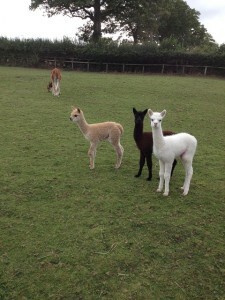 Three new additions to Coco Alpacas all born within the last 2 weeks. Its so nice when they are born close together as they have great fun frolicking around the field. 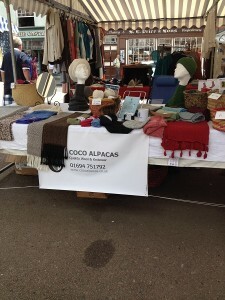 I now have a stall at Ludlow market once a fortnight. 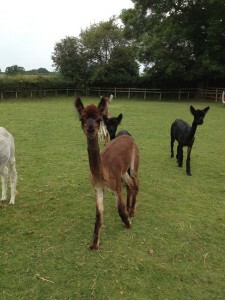 All the alpacas were shorn on Tuesday June 24th by Colin Ottery, who travels up from Devon shearing many alpacas on the way up to Shropshire. Luckily the weather help up and we had a nice dry morning for the shearing. All the fleeces are ready for processing and they will be sent to Farrlacey Mill in Lincolnshire to be made into beautiful yarn. This is a picture of the girls the day after shearing looking very sleak. 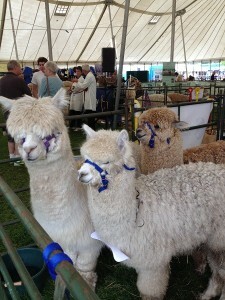 I took 2 youngsters (both 1 year old) Felix and Freddie to the halter show at the The Three Counties Show. Both of them were placed in their classes, so a very good day for a first time show. Fekix & Freddie are the 2 little ones with Wizard (the larger one) acting as a chaperone.